Posted on December 7, 2013 by Mara L.
Tennis In Central Park, By Mara L.
Jens tells me he took up tennis in Central Park, though not the fancy kind where you rent a court. He’s playing where the kids play, public courts fairly high up north, close to where he lives. I’ve been out of touch for too long, working and not keeping up with friends. On the spur of a moment I decided last week I would check in. As he was just about to go to the park, I joined him there. It’s utterly charming, parents teaching their kids tennis, groups of friends playing any kind of game where you’re hitting a ball against the wall, some men practicing what looks like Tai Chi on a smallish court. 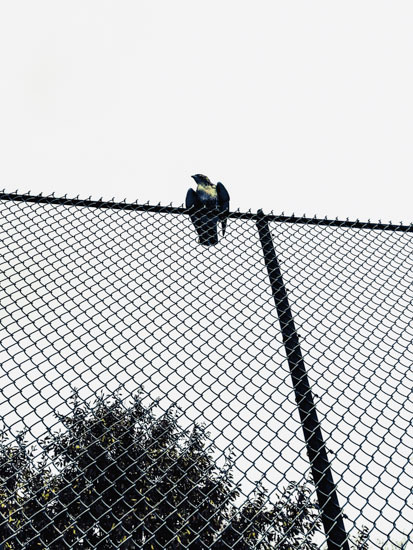 In the skies and on the fences, large birds. Eagles perhaps or hawks. I wonder whether the tennis balls to them look almost like prey, though never quite. Too yellow, too round. They don’t attack, they watch. Or whether all this activity interferes with what to them is their terrain, a disturbance to be scared away. Well, that doesn’t work either. For me, it’s a New York moment, in a neighborhood that isn’t quite the rich Manhattan of the southern edge of the park, but rather affected from the various recent economic crises. Incongruent, lovely, and a bit threatening. People going about their lives caring for their families and friends, having fun and getting some exercise that doesn’t cost money. Though if you just as much as raise your head you might as well worry. Next PostNext Tennis In Central Park II, By Mara L.